TimberCore Wood Plank Floors, the natural warmth and comfort of real wood with timberCore™ wood flooring. Designed for foot-friendliness, easy care, installation, removal and reinstallation, timberCore™ wood floors are 100% water-resistant for protection against water damage, such as warping, distortion, expansion, contraction, etc. Our floors are 10x times more durable than other brands, resistant to static, slipping, fading, abrasions, stains and more. And because timberCore™ wood planks are manufactured using natural, sustainable raw materials, such as premium pressed poplar wood and 75% less formaldehyde than laminate wood floors, they are also eco-friendly. timberCore™ wood planks contribute to a greener, healthier personal environment for our customers. They are the first brand of wood flooring to use premium pressed poplar wood instead of MDF or HDF, which uses powder and glue. Manufactured using natural, sustainable raw materials, they have 75% less formaldehyde than other brands, and deliver the same natural warmth and slight bounce of real wood. 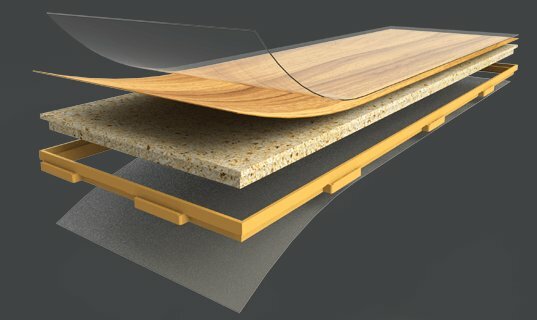 Thanks to our breakthrough nuClick™ plank interlocking system, timberCore™ wood floor planks can be installed and reinstalled 25% faster than the rest! The result is a truly impeccable fit, seamless finish, with exceptional breathability and the capacity for endless removal and reinstallation. The nuClick™ interlocking system is designed to firmly lock in every floor plank from every angle, easily and perfectly, the first time. The tabs are evenly spaced on all four sides for a tight fit that leaves no room for movement. Each plank slides perfectly into position by interlocking with its adjacent plank, resulting in a flawlessly aligned and completely solid platform. Spilled milk, water, coffee, juice, even wine? Relax! Every timberCore™ plank is fully embraced with our mBrace™ technology, ensuring 100% water-resistant protection against all moisture-related damage. Plus, ours is the only wood floor in the industry that can be removed after a flood and be reinstalled, easily and worry-free.